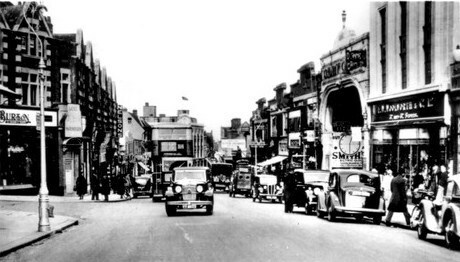 Woolworths opened their 285th store in Guildford in 1927. It originally was at 56 High Street, on what you can see is a slope, pictured below. They traded here for 30 years before relocating across the road. This photo was taken just before the relocation in 1958, and there are posters in the window announcing the move, as well as For Sale signs. Today WHSmith trades from this building. In October 1958 Guildford Woolworths relocated to a huge purpose-built superstore at 55 – 57 High Street, on the site of the former Lion Hotel. Its frontage was specially designed as a gesture of local interest, including a striding lion rescued from the hotel pediment. This photo shows the queue of people outside on the opening day – it must have been an exciting event. A couple of doors up is Marks and Spencer – you can recognise the clock. This is another angle of the queue. Guildford was special as it was a test store for introducing a Food Hall, similar to how M&S is today. Previously Woolworths had tested out a stand-along supermarket store, such as at Hounslow – Store 106 – but this wasn’t a lasting solution. Guildford introduced a self-service ‘Foodmarket’ at the back of the store, with it’s own separate entrance on North Street. North Street is quite far back from the High Street, so this Woolworths store was very long. See the photo below, where you can see the new-style weighing machine in the window. As well as the new in-store foodhall, Guildford Woolworths included the test design of a new cafeteria that ended up being rolled into many other superstore branches in the 1960s, with the name ‘Guildford-style cafeteria’. It was railed off from the sales floor, had a diamond patterned Formica counter front and rigid fixed seating, arranged in pairs on opposite sides of each table. [Extract from K.Morrison Woolworths 100 Years on the High Street] The seats were not very comfortable, being of the tilting cinema-seat style. This swanky new superstore Woolworths only lasted 26 years, as it was sold by Kingfisher in 1984. 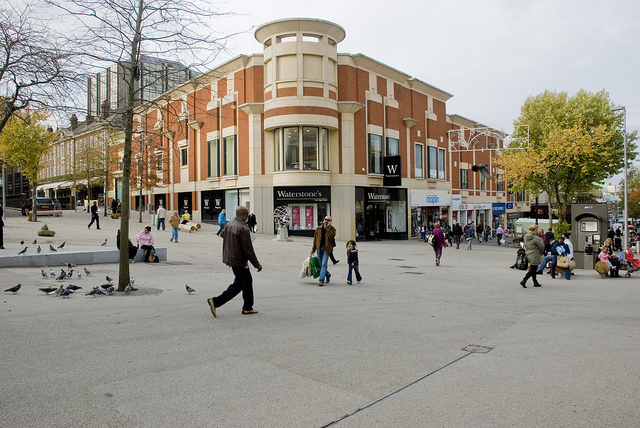 It was redeveloped as the White Lion Walk shopping precinct. I have taken a screenshot from Google Maps today, where you can see White Lion Walk, Next and Starbucks are where Woolworths was – the neighbouring stores are as they were (compare it with the 1958 photo). The whole store was demolished all the way to North Street to create this shopping precinct. 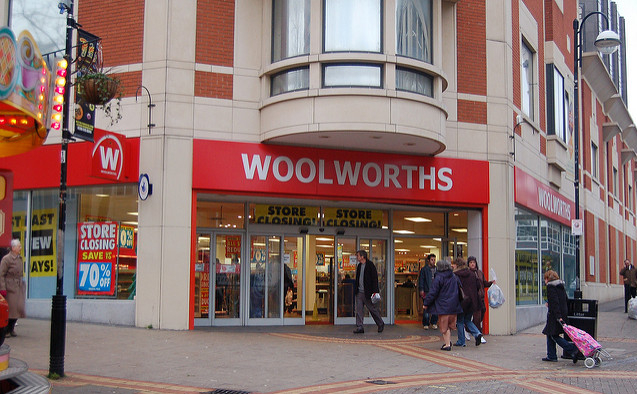 In 1993, Woolworths returned to Guildford on Friary Street as Store 1185. This store will be covered in a separate blog post in the future. 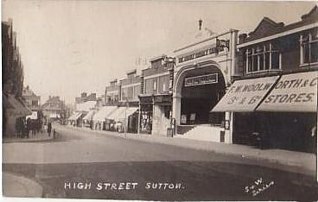 Sutton Woolworths was one of the very early stores of the chain. It opened in the High Street in 1916. In the below 1923 postcard, the Woolworths store can be seen on the right. It was next to the Surrey County Theatre which opened in 1921. Below you can see the store to the far right. I’m estimating this to be in the 1930s from the cars. 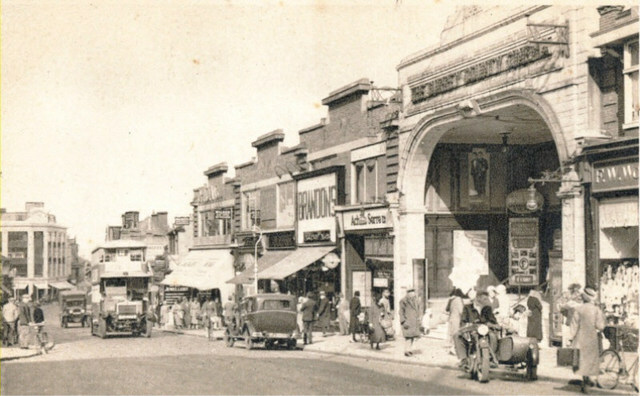 Below is a 1935 postcard, where it can be seen that the store has had a refurbishment with an art deco cinema-style facade, quite suitable considering what the neighbouring building was. 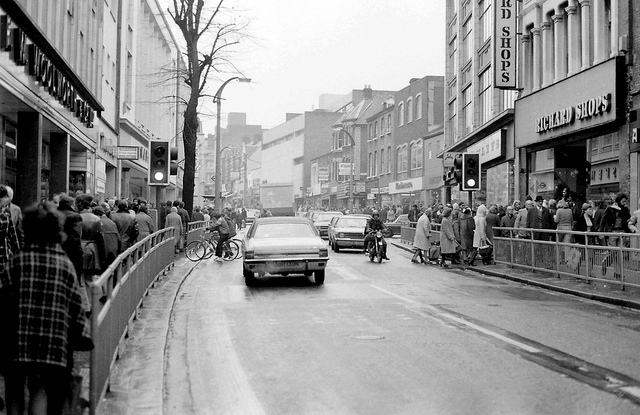 This photo was taken shortly before Sutton High Street was pedestrianised in the early 1980s. Woolworths is on the left, where you can see the store’s 60s makeover – with the upper floors covered in what looks like concrete. I don’t know the exact date Woolworths left this building, but I do know that the chain acquired Superdrug in 1988 and Woolworths opened in a new building at 71 High Street, Sutton in 1994. I will cover the 71 High Street store (Store No. 1192) in a separate post. The 43rd Woolworths store opened in Kingston Upon Thames on 14th November 1914, completing a ring of stores around London’s metropolitan areas – the others were Richmond, Wimbledon, Lewisham, Ilford, Peckham, Croydon, Harlesden and Brixton. It was on a prime location between Clarence Street and Church Street, in the heart of town opposite Bentalls Department store and the post office. The store was purpose built in a style that was in fashion at that time, with bold Classical flourishes, a strong centrepiece at the top. The centre of the store was difficult to light so a light well was put in. There was a first floor cafe and a small kitchen. In 1916 the store was widened towards the back and a second entrance was added at Church Street to help cope with the volume of trade, as well as the cafe being converted to another sales floor. Bigger premises were desperately needed, so they relocated to Market Place in 1931, where they demolished a hotel to build a half-timbered building with oriel windows and eyebrow dormers on Market Place. A taste for Old England facades came about at that time, possibly inspired by Liberty’s in London. The new store was built in stages, with sections added in 1933 and 1935. The style of the building was considered vulgar by locals, so it was remodelled in 1959. In 1972 the store was refurbished and a ‘Kwik Snax’ takeaway opened, replacing the old tea bar. In 2003 Kingston was one of the 10/10 trial stores that got a new look, a new fascia and a red walkway in store with counters at an angle. The store closed when the chain went bust in 2008 and it now is Clas Ohlson. The first store at 6 Clarence Street is now Barclays, it seems the little Woolworths building has gone. After Woolworths closed at 148/150 High Street, they moved down the road to 71 High Street. 71 High Street was quite a historical building in Sutton. 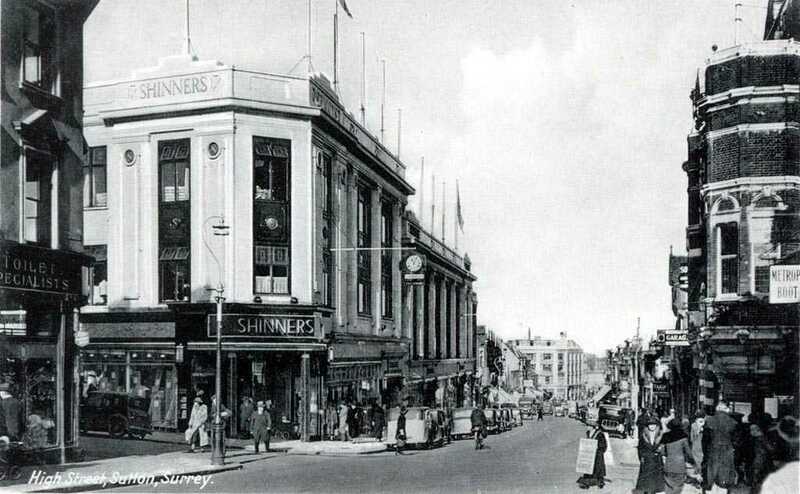 It was where Sutton’s first department store was located, called Shinner’s Department store, built in 1935. 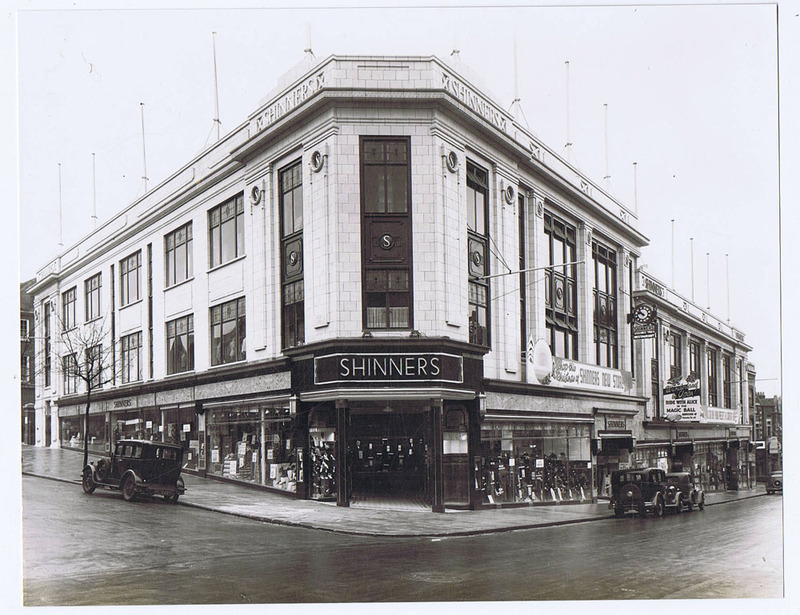 In 1979 Shinner’s was taken over by Allders, and they stayed in this building until 1991 when they moved into the new St Nicholas Shopping Centre (and then became Debenhams). Woolworths moved here in 1994, with a new store number 1192. It looks as though the building was rebuilt from the new-looking red brickwork, so perhaps this is why there was a 3-year gap. Woolworths traded here for 14 years until it closed in early January 2009. Waterstones moved in, and it was the first Waterstones to trial their Cafe W concept. Meanwhile, the former Sutton Woolworths store manager teamed up with another store manager to open the toy shop Toy Barnhaus, which is still successfully trading today with 7 branches.